During a recent stock-up run I realized that I had yet to review a beer from Rhode Island, a huge oversight considering that the smallest state in the Union has a strong craft beer scene. One of the staples of Rhode Island’s craft beer scene is Newport Storm, brewed by Coastal Extreme Brewing Company in picturesque Newport, RI. Newport Storm was started by four college buddies in 1999. As a Bowdoin graduate, I have mixed feelings buying a beer made by a bunch of Colby guys, but it is nice to see NESCAC grads putting their education to good use (for those outside the NESCAC loop, Bowdoin and Colby are small colleges in Maine that are rivals in almost every sense). Newport Storm has expanded and now distributes their beer to RI, MA and CT. They brew a series of year-long beers and specialty offerings along with “storms of the season” seasonal releases. Newport Storm’s Winter seasonal is a porter brewed with dark chocolate and crystal malts along with German Magnum and East Kent Golding hops. Newport Storm Winter Porter pours the color of black coffee with a minimal tan head. The smell is all dark malts, strong chocolate aromas followed by some coffee and roasted barley. The taste is also very malt forward, black coffee, dark chocolate and molasses. There isn’t much hop flavor, but there is a mild bitterness that balances the malt sweetness. 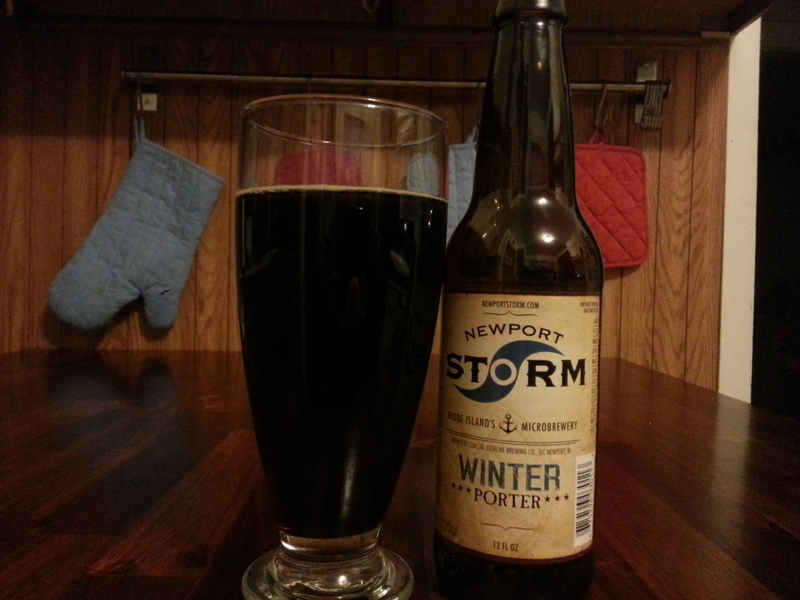 Newport Storm Winter Porter has a medium body and is pretty easy to drink, at 5.9% ABV it isn’t overly heavy. The finish is very clean, just a touch of malt sweetness on the tongue. Overall this is an easy to drink and well done version of a porter, great to pair with some hearty winter food. Hoppy Boston score: 4.25/5.